Sift flour, baking powder and salt. Beat in egg yolk and milk until smooth. Beat egg whites until soft peak stage and fold gently into batter. 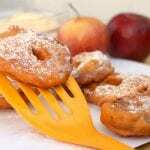 Slice apples into 5mm rings, dip into batter and deep fry in hot oil. Remove doughnuts from the oil and sprinkle with cinnamon sugar. Mix hot coffee with icing sugar to form a thick paste. Drizzle coffee drizzle over doughnuts.